Iam one in the lists who hate radish because of its fiery pungent aroma!but nowadays I get going with this vegetable because of its nutritional noteworthiness.When I started realizing the health advantage and well appreciable delicacies made out of radish buying this root vegetable have become a weekly affair. Here in my place I get fresh crunchy tender bundles of radish with fresh leaves in it!the leaves are tasty when added to parathas,soups and even salads.You will be staggered when you make this radish chutney because your circle you are feeding will never realize that it includes this root vegetable in it! you have to confess it to them and then only they become aware of!Adding ginger to it masks the distinctive smell from radish.You can increase spiciness according to your spice level because I have added only one green chilli to it.Now lets make radish chutney..
1.First add oil in a kadai when it heats up add urad dhal kadalaparuppu and when it is brown add onions,chilli and ginger. 2.Add tamarind piece and salt and saute well,then add radish and mix. 3.Mix nicely for some time then sprinkle some water(1 tbsp approx) close the lid and cook. 4.When it become dry check for the veggie whether cooked. 5.Switch off and when cool add to mixer and grind with coconut scrapping(add needed water when grinding). 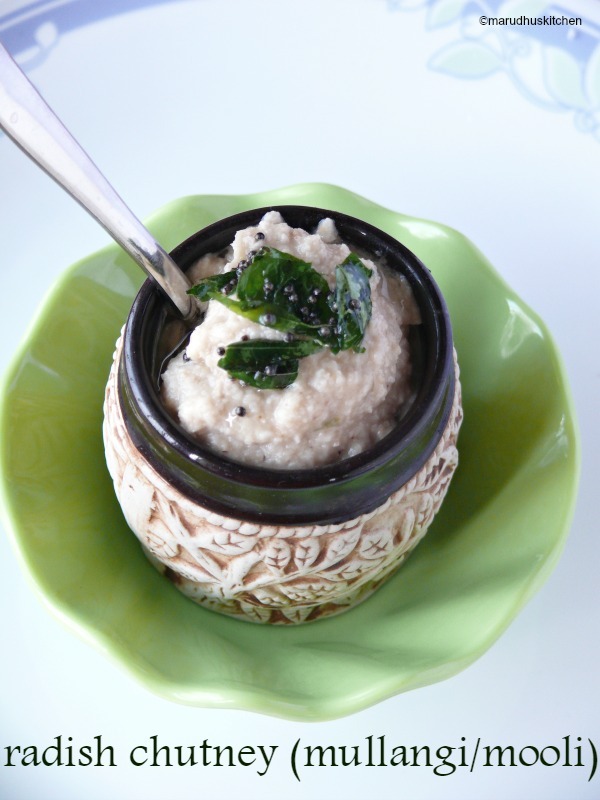 6.Do tadka and serve with idli and dosa. First add oil in a kadai when it heats up add urad dhal kadalaparuppu and when it is brown add onion,chillies and ginger. Add tamarind piece and salt and saute well,then add radish and mix. Mix nicely for some time then sprinkle some water(1 tbsp approx) close the lid and cook. When it become dry check for the veggie whether cooked. Switch off and when cool add to mixer and grind with coconut scrapping(add needed water when grinding). 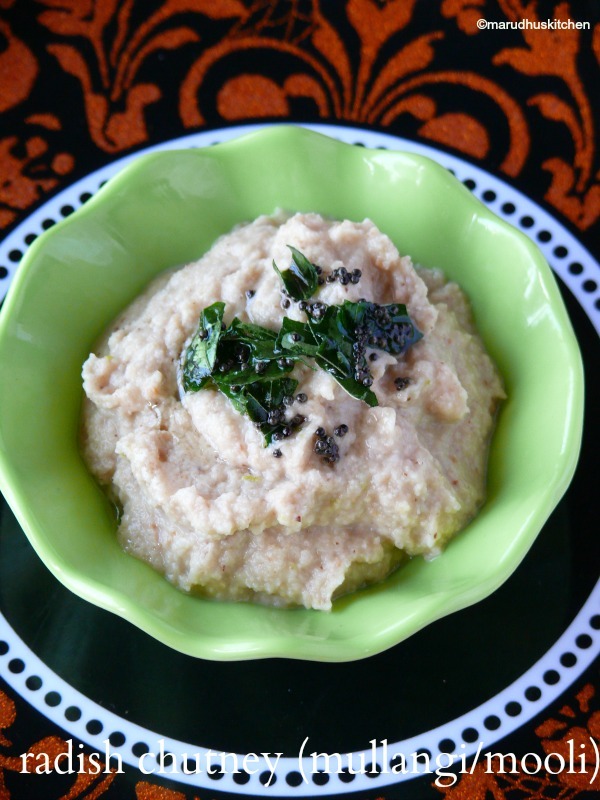 Do tadka and serve with idli and dosa. We can make this chutney even without coconut. Adding ginger to it masks the distinctive smell from radish. You can increase spiciness according to your spice level. Use tender radish so that it cooks quickly and we get tasty chutney. New dish for me.. will try this one day..
perfect and healthy Mooli Chutney…..
Nice recipe, never heard about mooli chutney.Nicely explained will try it soon.